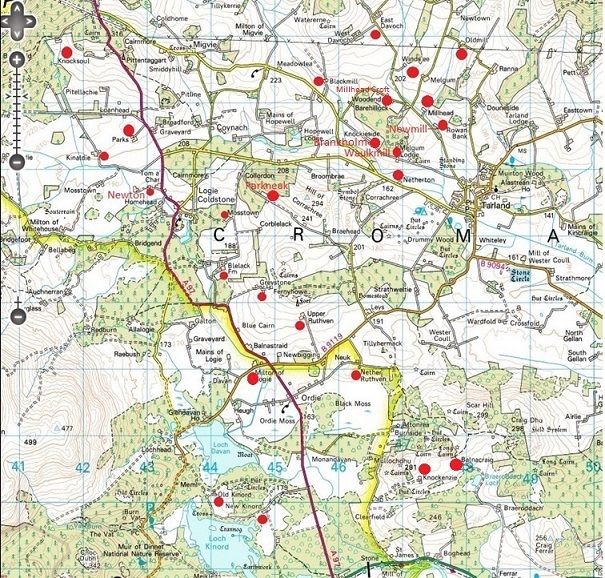 The map above links to Streetmap and OS maps. A lot of very useful historical maps can be found at The National Library of Scotland site including this OS map from around 1874 covering a good part of Logie Coldstone. Logie Coldstone lies on Deeside, about thirty five miles inland from Aberdeen, in a basin of land known as the Howe of Cromar. This is an area made up of fertile agricultural land, forest, lochs, burns and rough ground surrounded by hills, most notable of which is Morven. Logie Coldstone church parish existed from 1618, when the two separate parishes, Logie-Mar and Coldstone were brought together. It ceased to exist when it became part of Cromar parish in 1984. The name is still commonly used for the broader area as well as for the small village of Newkirk. The name Logie derived from the Gaelic word lagan which means a hollow, or low lying land. This was distinguished from the many others named “Logie” by referring to it as Logie-Mar. The first documented reference to Coldstone seems to have been in 1275 AD in The Old Taxatio taxation records. It was recorded then as Col-essan (meaning corner of much water), but over the years was also recorded in many different forms, the final one for the Parish as such being Colquholdstone, at the time it was merged with others. It has also been suggested the current name might come from the more similar sounding col-struan (corner of many streams). The church itself, which has now long gone stood on a hill, Kirkhill as it is recorded on maps, next to the Coldstone graveyard which can still be found as well as a nearby ancient stone cross/slab. As regards ownership of Coldstone, an early charter was given by the Bishop of Saint Andrews to Lord Forbes of Kinaldie on 5th November 1439. Numerous charters followed, showing the Forbes kept possession until a complicated series of transactions and court cases between 1692 and 1695. As a result of those, first William Farquharson, then his brother John Farquharson of Invercauld acquired the bulk of the lands. The Farquharsons of Invercauld owned Millhead and many of the other farms occupied by Essons, as evidenced by the copies of leases and other documents we have. The location of the early parishes Coldstone and Logie-Mar can still be seen, by comparing the 1696 List of Pollable People For Tax Purposes in Aberdeenshire (Volume 1) with the names of some of the farms on the map below. Other landowners or heritors in the area at that time included the Forbes, the Gordon’s, and the Lairds of Logie, Drum, and Skeen amongst others. The family were almost always called Easson in this area, until the late 1700’s. A list of farm names where they lived, albeit far from complete, includes the following. Balnacraig, Bearhillock, Belwade, Bog, Brankum, Charlestown, Coldstone, Corrachree, Daugh, Davoch, Bogstone and Clashnettie in Strathdon, Drumgask, Glebe of Logie, Loanhead Knocksoul, Melgum, Melgin, Mill of Corrachree, Millhead, Mosstown – Tulloch. Monandavan, Upper and Nether Balnacraig, Upper and Nether Ruthven, Newtown, Upper and Nether Ruthven, Windseye and Waulkmill. First records for the area show Eassons living in a handful of farms in a small area, just to the North West of Tarland . Patrick Esson was recorded at Waulkmill in 1675. Waulkmill, as its name implies was a woollen mill, burnt down or destroyed in the early 1900’s. Close to this spot Eassons were recorded in the 1696 “List of Pollable People” at the three neighbouring farms of Blackmill, Newmill and Millhead, and a couple of miles away at Mill of Kinaldie. A John Esson was recorded as living on the Laird of Skene’s land, possibly at the Newton, close to Kinaldie. There would have been more than the tax list named, including family members, sub tenants and landless workers. The small group of farms where they were first reported seems interesting however, and leaves little or no doubt that these people were related. The first baptism of an Esson in Logie Coldstone was recorded in 1719 when a John Esson had a son called Peter. John Esson had more children, and family members remained here until a later John Esson and his wife Mary (ne Forbes) left the place in 1874 to take on a public house in Aberdeen at 17 Castle Street, the place today of Castle Bar and Portals Bar. Some returned to Millhead itself later as workersm and some were at Millhead Cottage up until the 1900’s. Our family line lived at Millhead for the best part of 200 years. With family sizes often of five or more children, the population grew and by 1750, around 250 baptisms were recorded for 74 families at over 30 farms in this alone. Millhead is on Melgum Road at the point the Millhead burn runs down to join Glaick burn on its way to Tarland. The name Millhead refers to the small dammed pool higher on the burn, used to manage the water supply for Blackmill and Newmill just downstream on Glaick burn. Typically, mills would have a dam to drive the mill wheel. If the water supply was not great enough to support a continuous flow throughout the day, it would be allowed to fill each night so as to drive the mills for as long as possible the next day. Farms themselves often had a small reservoir for a mill too. Where there was no water, or not enough water for energy needs a horse wheel was usually added, Both ultimately gave way to small two stroke type engines when they became available. It is common to see evidence of all three. Prior to around 1750 Millhead was documented as Milnhead. In the 1696 List of Pollable People For Tax Purposes in Aberdeenshire (Volume 1) neither name appears. Almost certainly it was added as “Loanhead”, probably incorrectly. The Reverend John G. Michie in his book History of Logie Coldstone and the Braes of Cromar of 1896 seems to confirm this, with a note questioning whether this “Loanhead” was in fact Millhead. (There were two other “Loanhead”s listed near Coldstone kirk, Easter and Wester Loanhead). The house would have accommodate a number of families and buildings at the back subtenants and single workers. The map and link below gives an idea of church parish boundaries helpful when considering old records. The two books below discuss the origins of place names, many of which are derived from gaelic.. obviously.. The glaciers of the last Ice Age left Deeside around 12,000 years ago. As they did so they shaped and revealed many features of the landscape we see today, including the melt water channel of the Burn O’ Vat and the great “kettle holes” formed by stranded ice that ultimately became Loch Kinord and Loch Davan. At that time, the area was connected directly to the European land mass, and game and other animals would have started to migrate here in search of grazing as the climate warmed sharply. With them came groups of people, the hunter gatherers of the Mesolithic. About 24 miles East of Logie Coldstone at Warren Field, on Crathes Castle Estate, a “lunar calendar” thought to be around 10,000 years old has been identified. This consists of a series of pits designed to hold posts aligned with the cycles of the moon and sun. It is thought to have been been used to predict seasonal changes, a critical activity for people whose survival depended on migration, hunting and foraging,. If the assumptions on time and purpose are correct, (although that is under discussion), this pre-dates known “lunar calendars” elsewhere in the world by around 5,000 years. In 2012 Reading University carried out an excavation at Waulkmill, close to Millhead and Tarland. The document linked describes the excavation, which uncovered remains from Neolithic (4,000 to 3,500 BC), Bronze Age (ca. 2,500 BC) and Roman Iron Age times. The Waulkmill excavation was carried out near the site of an old stone circle, of which only one of the 12 or so original stones remains. 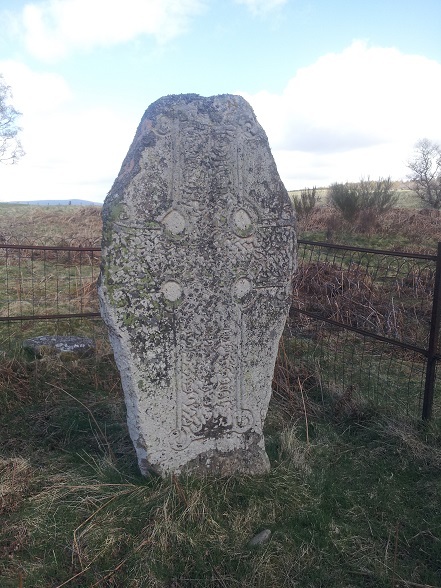 There were many stone circles in the area, and many signs remain, for example at Doune Hill and Knowhead, with the most striking, albeit restored site being at Tomnaverie, near Tarland. This dates from around 2,500 B.C and again was thought to be aligned with lunar cycles. Tomnaverie is an example of a recumbent stone circle, a type of circle found far more often in Aberdeenshire than elsewhere. Like others of its kind it has a massive flat stone laid on its side, level, wedged between two upright stones in a way which frames the moon at its point of lunar standstill a phenomenon which occurs every 18.6 years. Tomnaverie’s recumbent stone and two uprights also frame Lochnagar in the most impressive way, and Morven and Mount Keen are to either side so it is easy to see why the site, a hillock raised overlooking the area below for miles around might have been chosen for its purpose. Scattered quartz crystals at this site suggest they were used in rituals here. As mentioned above, the Waukmill excavation revealed Roman remains. These includes burial artefacts, jewellery and game pieces. It is increasingly being realised how extensive the Roman presence was. Roman encampments are more common and often larger than once thought. A site at Inverurie is now thought to have been the size of 60 football pitches. Throughout its history the wealth of the land of this place and the ferocity of its people meant that strategic places, including access routes had to be protected by fortification. Many iron age sites are evident, and in Mediaeval times substantial castles dominated the scenery. Map from The Making of the Scottish Rural Landscape by David Turnock. Routledge. Copyright. To the South of Deeside lay high exposed and boggy moorland called mounth. Through this only a limited number of passes offered sensible access to the country to the North. From Deeside, the routes made their way North, again following a small number of viable routes. Capel Mounth, Fir Mount Munth Keen Road all arrived, (or left) Deeside to the south of Cromar, while important routes North went North of Davan, past Towie to Strathdon or North via Tarland. These strategic places were protected by significant castles in Mediaeval times, as were any sites which offered military advantage. Another name for this area besides Logie Mar was Logie Ruthven, where Ruthven meant fort. There was no shortage of them here. Kinord had a castle on its largest island and a tollbooth or prison on a neigbouring island. On Davan, surrounded by a sophisticated set of moats and sluices was the Ha’ of Logie Ruthven mentioned in Wyness’s account of the battle of Culblean. Migvie castle, now almost invisible, was once an important seat of government for the Earls of Mar. There are suggestions a fort existed below the now flattened church of Coldstone which stood on the side f another shallow loch, now drained. Farther afield was Coil Castle belonging to the Durwards, Lumphanan’s Peel Castle of the Lundin’s, Aboyne, Craigevar, Kindrochit and Kildrummy to name a handful. The map to the left shows strategic routes through Deeside and sites of castles in Aberdeenshire. Judging by the fortifications and military activity visible it was also an area which seemed worth defending and fighting over. In part this all explains why the area has such a rich history and archaeological record. Despite appearances today, Deeside as a whole and Cromar itself have been far from quiet and unchanging places through the centuries. In The History of Loch Kinnord John Michie describes an extraordinary history of settlement around Loch Kinord, Loch Davan and Culblean. This includes Neolithic remains and an extensive Iron age settlement near the two lochs, with fortifications, artefacts and a crannog. The History of Logie Coldstone and Braes of Cromar by the Reverend John Michie and Tales and Memories of Cromar and Canada. by Donald Farquharson are both old books but they give a very good view of the history of Logie Coldstone and an idea of how earlier times must have been. The following includes a few points of general interest for the area, and some links to worthy documents on a more recent timeline.Some references to Essons are included. Edward I, the infamous “Hammer of the Scots” camped twice with a large army at or near Loch Kinord when he came to plunder and suppress the area. In 1504 James IV visited Kinord Castle in a journey which was reputedly based on a bet on how little expense (for him) he could travel for. Payments to the castle, owned by Gordon, Marquess of Huntly were recorded in detail. In common with many places in Scotland, England and across Europe at that time, witch trials were held in Logie Coldstone and Lumphanan. Witch trials were a phenomenon which lasted three hundred years in Europe with loss, some say, of 40,000 lives. At the turn of the 16th century James I and VI of Scotland and England was adamant about the risk, publishing his book “Daemonologie” in 1599. He demanded witch hunts and trials were carried out and in 1597 John Gordon, 2nd laird of Blelack was obliged to convene a trial, while a group of Parish elders sat in judgement at the Kirk of Coldstone. In 1637 and the years that followed, chaos reigned over matters of religion and the interference of the Charles I in church and state. These years proved very difficult for people in Cromar, primarily as a result of plundering and oppression by opposing armies and what were often little more than bandits. On top of conflict over religious matters, Presbyterian versus Catholic and government versus Royalist, enmities between clans and families played a large part in the problem. The conflicts, loyalties and enmities had far reaching effect. In 1638 a National Covenant was created and signed, in an effort to bring together those resisting changes being imposed by Charles I. By the end of May 1638, the only areas of Scotland where the Covenant had not been widely accepted were the remote western highlands and the counties of Aberdeen and Banff, where resistance to it was led by the royalist George Gordon, Marquis of Huntley who opposed the government aligned Covenanters. Montrose, initially with the Covenanters turned to join the Royalists in time. Cromar was plundered seven times in one year by the two opposing armies who advanced and retreated as seemed expedient. At one point a Covenanter army of over 2000 men camped outside Tarland just days after the Royalists had left. Crops, goods and livestock were taken, people and animals were ransomed. In the absence of any form of law and order at times, the local people, including those who lived in Logie Coldstone and around were looted by nothing other than bandits. John Farquharson, who later came to own much of Logie Coldstone was one of the few to maintain a semblance of order. Opposing armies moved back and forth through Deeside during the conflict, demanding provisions for their upkeep, billeting men and levying fines as they saw fit. Notably for Logie Coldstone perhaps, Charles II was restored to the throne in 1660. This meant that Royalist supporters in the earlier conflict, such as John Farquharson of Invercauld were favoured, while opponents such as the Forbes found harder times in some cases. This may explain, in part, how the exchange of lands in Logie Coldstone went at the end of the 1600’s from Forbes to Farquharson. Leaving aside the time of the Covenanters, much of the 17th and early 18th century were lawless times, and cattle thieves and raiders were common. They often became involved with armies in bigger conflicts and at times those gave ordinary people a respite as the bandits went off to fight too. One notorious outlaw was Gilderoy, thought to be Patrick McGregor, a leader of a notorious group of bandits, or limmers as they were known. He is famed in legend for hiding out in the Burn of Vat cave. There is a small cave, still named Gilderoy’s cave, where he is supposed to have hidden behind the small waterfall. The whole valley and the almost enclosed Vat cave itself offered some concealment though, and would clearly have been easy to defend. He and his band were not romantic people to the locals who were often terrorised or had their property stolen. Ironically it seems he was originally encouraged to contain lawlessness in the area by the Marquess of Huntly, but became as bad if not worse than the worst of the bandits. He and his men were renowned once for burning down many farms in the area on the day when people were away at a wedding. He was eventually caught and hanged in 1638 at Edinburgh. Even after Gilderoy was gone, his band continued to cause trouble for some time, until they were also caught. In December 1666 Robert Fforbes of the Miln of Melgum, a short distance from Millhead was indicted at Edinburgh for going into Tarland one night, heavily armed with sword and dirk to the house of John Ross and wounding him several times and injuring the man’s hand to the extent he lost use of his finger. It was said this was when John Ross grabbed Robert Fforbes sword in self defence. The case was tried in June the year after, and the accused found guilty not of mutilation in the end (which carried the death penalty), but of wounding for which he went free after paying £40 in compensation to the victim, with what sounds like a degree of relief. After the indictment being recorded in December 1666 the trial itself and detailed debate is recorded in “The Records of the proceesings of the Justiciary Court, Edinburgh, 1661-1678 – page 218 which hopefully remains at the link below. There was a variety of Jacobite risings and planned actions from 1689 onwards. It seems it was only the final one in 1745 which greatly, directly affect Deeside and Logie Coldstone. In the 1690’s Scotland as a whole suffered the “seven ill years” of famine. In Aberdeenshire as a whole the population of some parishes fell by up to 20% and death by starvation and disease was common. At the same time there was a massive national investment in what proved to be a failed venture, the Darien mission, intended to set up trading posts in Panama for Africa and Asia. The combined impact of these disastrous events along with other factors, led to widespread emigrations from Scotland. Between 1650 and 1700 approximately 7,000 Scots migrated to America, 10-20,000 to Europe and England and 60-100,000 to Ireland. Emigration to Ireland, particularly to Ulster, was a continuation of a process that had been underway since the early seventeenth century, with population of cheap and abandoned land in the north created by James VII’s invasions in the early 1690s. It has been estimated that 20,000 Scots emigrated to Ulster between the famine years 1696 and 1698. How much affected Cromar and Logie Coldstone were by these events I am not sure. Its true later records in the 18th and 19th century usually showed more than enough grain was produced here, and recorded numbers of poor were few. Having said that there seems little reason to assume it escaped wholly and maybe some of the absence of comment reflects how low people’s expectations of normality were as much as anything. Throughout history the area must have been affected badly by a harsh climate, disease and limited medicine, along with food shortages, wars and bandits. The style of farming in early times was certainly less than optimal and made poor harvests more likely. Old field systems, the old wooden plough, lack of clearance of stones, and waterlogged ground together with choice of crops were all things that put harvests at greater risk in earlier times. Speaking more generally again it’s no wonder that the 1696 Poll Tax proved so unpopular in Scotland, and despite the extensive documentation, collected so little tax. The book Records of Invercauld explains that Forbes owned the Barony of Kinaldie and Melgum. These made up most of the land in Coldstone and surrounds. He planned to sell land to Elphinstone, but William Farquharson took court action – probably many court actions, and winning the case he was able to buy the land from both baronies including Coldstone. William died quite soon after and so the land passed to his brother John Farquharson who became the biggest landowner in this area by far, as the 1696 List of Pollable people states. As such Invercauld owned farms such as Millhead (Milnhead as it was sometimes called) and Melgum etc. Around 1745 just before Gordon of Blelack set off to join the rebellion he asked John Farquharson, an acquaintance and a noted “wizard” who is said to have lived at the Parks of Coldstone (some say he was at Carue or Nether Ruthven) to get rid of some fairies who lived in the Seelie Howe at Carue farm (on Carue Hillock). They were a nuisance to Gordon it seems. How? who knows ? maybe they just upset superstitious workmen. “Seelie”, supposedly from an ancient word meaning happy or lucky was a word used to refer to fairies. There are a number of burial cairns in the area, and what appears to be a souterrain where stone cups were said to have been found at a higher point, near Ferny Howe above Upper Ruthven, where there is also an unfinished fort. Perhaps the belief in fairies came from attempts to explain ancient remains and some unfortunate events in the area. Anyway the story is well known. John Farquharson persuaded them to go the Hill of Fare which they didn’t like, and as a result they cursed the Gordons and the Farquharsons. The curses are also well known. If nothing else this shows the level of superstition in those times, a world before most of the advances of science and medicine we take for granted today. Fairy hills, seelie courts and wichts are commonly described in Scotland and the rest of Britain. Unusual patches or grass, rings of fungi, and especially tumuli and inexplicable remains were things people attributed to fairies, who were as in this case, best left alone, in case they turned nasty. Maybe someone had a reason for spreading a rumour of angry supernatural creatures. Someone made those verses up, and it was not fairies. This John Farquaharson seems possibly to be related to the Essons indirectly by marriage. The writer of Reminiscences of Cromar and Canada, Donald Farquharson mentions his father was cousin to William Farquaharson of Newton in Melgum. Their family claimed descent from John Farquharson. A William Farquharson of Newton in Melgum was at the reading of Christian Anderson’s will, as he married her daughter, Margaret Esson. Tales and Memories of Cromar and Canada. Jacobite Rebellions took place over an extended period from 1689 onwards . It was only the 1745 rising which had particularly serious implications for this area. Some of Charles Gordon of Blelack’s story in the rebellion is shown at the link here. The 1745 rising is described here: Some Letters and documents here: The History of Logie Coldstone and Braes of Cromar describes how Blelack’s and Farquahrson of Monaltrie’s soldiers were in the trenches at Stirling castle. Leaving there the army split in two at Crief – half went on through Blair Atholl and half went over Capul Mounth from Glen Clova then on to Coldstone in Cromar and Tarland on their way North. (page 137 onwards). The book “A Lyon in mourning” is a collection of writing by Robert Forbes Bishop of Ross and Caithness (1708 – 1775) written after the rising. And this web page is about Francis Farquharson. Francis Farquharson was known as much as a benefactor of Deeside building roads and doing good works as for his part in the rebellion.The Farquharsons of Invercauld owned Millhead. For some reason when the debts of Francis Farquharson were settled in 1770, a debt was repaid from Francis Farquharson to Margaret and Jean Farquharson who were living in Millhead at the time of the rebellion (described above). Francis Farquharson (Farquaharson of Monaltrie) – who went South with the Army was a Jacobite sympathiser, unlike his uncle John and he raised troops to fight. He was captured at Culloden and sent for trial and execution to London, but was pardoned after a petition was raised to save him. He was imprisoned still, but eventually released and he married into the Eyre family in Derbyshire before returning and leasing back some at least of his estate at Monaltrie which had been confiscated after the rising. The table below shows people who were at Culloden with the name Easson or from familiar locations. A series of legal actions were were pursued from the time of John Esson’s death against his sons, Joseph and William, John and Peter (at least against his widow Rachel Coutts). What seems another John and Robert Easson who were at Knocksoul were also sued. A bit complicated they seem to go like this. 1. In 1765 Alex Bowman (a resident of Aberdeen took action against Joseph and his brother William while they were at the Newton when they were executors to their father John’s will. 4. 1798 Joseph failed to pay and was pursued for arrears of £13-15s-1. In order to avoid going to court in Aberdeen Joseph wrote a letter on December 1st 1798 offering to pay by a number of means. Robert Esson of Millhead was to act as security and arbitrator. Payment was to be a cheque of £2.10 was forthcoming from someone at Milne in Glack of Migvie, a cow and three stirks owned by John Easson of Knocksoul (his brother I imagine but some relative at least likely) and Joseph would give as many sheep as he had, to cover the rest or offer his son Alexander to William Reid of Prony who would secure the payment to Invercauld by Bartholomews day. This seems to be the content. 5. 1798 William Reid of Windseye took Joseph Easson late Newton now Sweetwells to court for money. (W Reid – writer in Prony ? tacksman of Charles Gordon took action against Joseph Easson and Janet Middleton in Prony. They had to leave Prony with servants. William Esson of Melgan b. 1762 and Robert Esson b. 1753 of Millhead were taxed £3/2s for horse tax (in 1797). Joseph Easson and many others tenant farmers were taken to court by the Farquharsons. It seems Joseph was obliged to move and the times must have been very tight for some reason. The damages Joseph had to pay are listed in the Esson family notes. The Church at Newkirk was completed. There was famine in Aberdeenshire. In Sherriff Court Deeds SC1/62/4 It notes James Farquharson had died and his trustees were arranging new Tacks or rent. 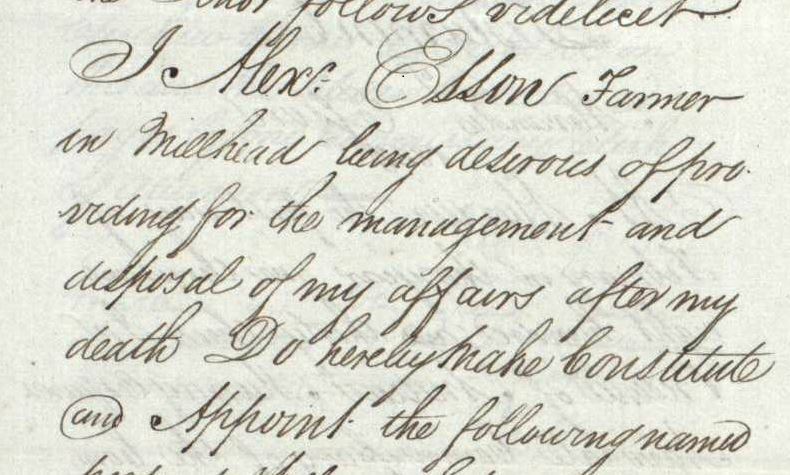 Alexander Esson took a lease for 19 years from Farquharson of Invercauld. The annual rent was to be £66 plus 20 bolls good oatmeal, and 4 bolls, 1 firlot of English coal, carried by him to Invercauld or any place above Culblean. The coal was to weigh 36 stones (or failing the coal 5 shillings a year as the proprietor chose). This to be paid by Martinmas. Alexander Esson and his wife Christian Anderson lived, as Alexander’s parents before them in Millhead. Christian was the illegitimate daughter of Alexander Anderson 9th Laird of Candacraig, a prolific but not the less benevolent father of illegitimate children. Anderson helped the family somewhat, and was recorded giving Alexander, yje couple’s child £100 to help with his education at Aberdeen University. There Alexander “junior” graduated as a doctor, then served with the army in India. Alexander, Christian’s husband died on 26th June 1832 aged 65, leaving a will as did Christian who died on 18.4.1854 age 78. In April 1842 a Robert Esson (of no known relationship we know of) was convicted at Aberdeen Court of Judiciary and sentenced to 14 years deportation. Rightly or wrongly, the trial’s indictment listed a number of cases of horse and cattle theft in great detail. These were undertaken in the area to the North of Aberdeen, including one case at Crimmond and one in New Deer. There were also 26 witnesses listed. For this he was deported to “Van Diemens land”, now Tasmania. The ship Waterloo set sail on 30th May 1842. It must have been a harsh voyage. The ship was owned by contractors and was on its 7th convict shipment to Tasmania. It was not seaworthy as was soon proven. After 3 months at sea the ship’s surgeon urged the captain to put into shore at Cape Town, South Africa as many on board were suffering from scurvy. This they did and anchored in Table Bay. Due to the ship’s poor condition it broke up when hit by a North Westerly gale. Robert Esson drowned along with 189 other convicts, crew, passengers and families on 28th August 1842. The poor state of the ship, and mistakes made in the storm led to a great deal of criticism, but no action was taken against owners or crew. The 1845 New Statistical Account for Scotland noted how greatly Logie Coldstone’s agriculture had improved since the previous survey in 1790 . It also noted only 18 poor (presumably people not families ) and 190 families in the Parish. James Grant (1822–1887), the son of Captain John Grant of the 92nd Highlanders. and a relative of Sir Walter Scott was a Scottish novelist and historian. In 1854 he published a book called “Phillip Rollo” or the “Scottish Musketeers”. Within the historical fiction of that swashbuckling novel is a further story, obtained by its main character, supposedly from a manuscript owned by a dying soldier with a terrible secret. The lesser story, set in 1574 is called “The Lily of Culblein”. It is contained in chapter 22 in the copy linked below. Again almost certainly all historical fiction, this story contains extraordinary detail, slightly embellished no doubt, of places around Logie Coldstone as it is now, and extends to a description of the battle of Glenlivet. One of the protagonists, a Heathcliff like figure is the dying soldier. He is the young Halbert Gordon who had later taken the name Koeningham. 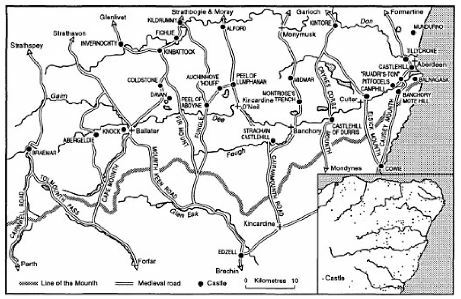 These Gordon’s, the book states, were Catholics who lived in the “Moat of Colstain” on the banks of Davan. This place was almost certainly based on the remains of the real life Ha’ of Logie Ruthven. Canmore, the archaeology site, suggests this place was beneath Coldstone Kirk but that is clearly wrong, as reading the story shows. The other two characters involved are Lily Donaldson, the heroine of the story, and Kenneth Logie who both live at a mansion on Culblean moor, which is described as a vast expansive forest. On September 14th Queen Victoria went up Morven ultimately by pony with a large convoy, going from Gairn Lodge to Morven Lodge and then to the summit on a clear day with a good view. Victoria’s history and influence in Deeside from when she first visited in 1848 is well known. In 1853 the Deeside railway was started, reaching Aboyne in 1859 and Ballater in 1866. The line had stations at Dinnet and Cambus O’May and so must have been useful for Logie Coldstone, for any who needed to go so far and who had the money to do so. No doubt it was a benefit to the area from tourists who arrived, including those who no doubt used the Cambus O’May station to stay at the Cambus O’May hotel built in 1874. John Esson and his wife Mary (ne Forbes) left Millhead and leased an alehouse and spirits business at 17 Castle Street in Aberdeen (now Portals Bar). The owner then was an Alex Sutherland of 18 East North Street. The Aberdeen Burgh Valuation Roll in 1875-6 confirms their tenancy. These were the last Essons in Millhead it seems. The ten yearly census records from 1841 to 1871 show John Esson and Mary Forbes farming 80 acres of land but no Essons in 1881. Their children, such as Alexander Esson also appear to have left at this time. Alexander went to Netherton and then Millhead Croft or Cottage. 1876 or so (b. 6/9/1821) Henry Esson of Balnacraig helped with the creation of the Ordnance Surveys name book around Balnacraig. On Dinnet Moor overlain by peat are rich layers of a crumbly sedimentary rock called white clay, diatomaceous earth or kieselguhr as it is known in its processed form. This extremely absorbent and mildly abrasive material is made up from the skeletons of minute algae laid down some millions of years ago. The material has been put to many uses, from storing foodstuffs to a mild abrasive in polish and toothpaste. In 1867 though Alfred Noble discovered that the processed material could absorb up to 4 times its own weight in nitroglycerine. Doing this produced dynamite, a far more stable and so much more useful explosive than nitroglycerine. It was for this purpose that kieselguhr was dug from Black Moss and nearby places from the 1880’s up until the end of the first world war (archival photographs from 1917 suggest that). Up to 50 men were employed, and around 200 tons are said to have been taken from both Black Moss and Ordie Moss in 1885. Runed buildings associated with the works can still be seen, marked on the OS map as “kiesleghur” on the track beyond Monandavan cottage. The material was dried and sent mostly to the Ardeer explosive works in Ayrshire, where organic matter was burnt off in kilns, to form a sixth the weight of useful kieselguhr. This in turn was used to produce dynamite. It is also said to have been used at times to line trenches during World War I. The pictures at the link below show the operation in 1917, and there are many more pictures on the internet. In 1898 Margaret Isabella Low married William Esson, joining the Esson family. It seems she had 14 brothers and sisters. Of those 2 died in infancy, 3 stayed locally, 3 went elsewhere in Scotland, 1 died at 47 from TB, 2 went to Canada, 2 went to New Zealand and 1 went to America. It’s been said by some in the family that of those who went abroad all did well, apart from one who had a bad time harvesting as a farmer with very bad snow and rust disease of their crops.